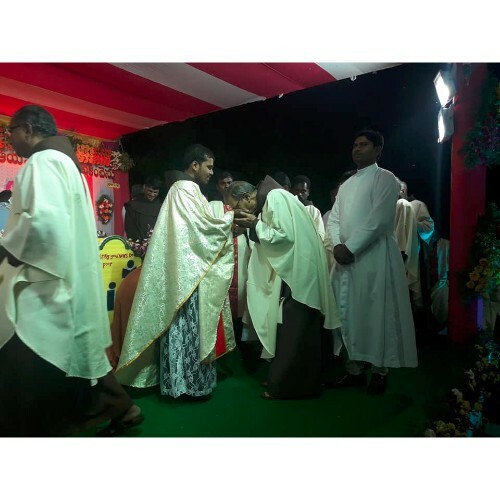 The Priestly Ordination of Brother Gopu Rajasekhar was held on 27th December 2018, at his own home-parish, Church of St. Paul the Hermit, Tubadu, Andhra Pradesh. The celebration was presided by Rt. Rev. Dr. Chinnabathini Bhagyaiah, Bishop of Guntur. The two main Concelebrants were our Provincial Minister and the Provincial Superior of MSFS who hails from the same village of Rajasekhar. Along with the local faithful, there were many diocesan clergy and religious Sisters at the celebration. It was a delight to see our Franciscan presence through a good number of brothers from various communities. The guest friars enjoyed the hospitality of the people of Tubadu. The people in whose house we stayed, took care of us very well providing us with all we needed for a comfortable stay. The event was well organized. The liturgy was very meaningful. The Parish Priest together with his predecessors, took minute care to see to every requirement for the ceremony of the Ordination. The whole village was involved right from the procession till the felicitation. It was typically a festival of the village! The parish priest, the religious sisters, and the people of the village worked together with the Gopu family and, thus, everyone was happy that Br. Rajasekhar was ordordained to the Order of Priesthood. 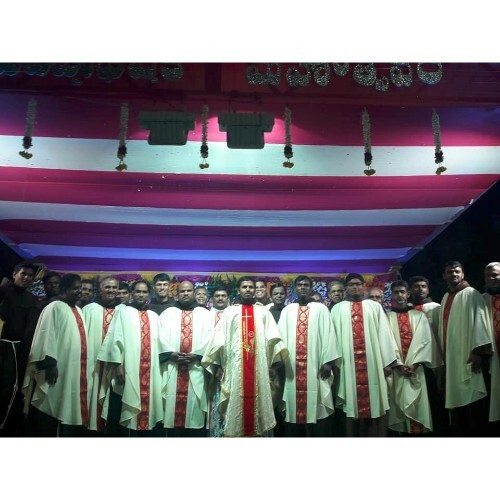 On the next day, 28th December 2018, the people and friars gathered at the house of Brother Rajasekhar. During a short prayer in the house of Br. 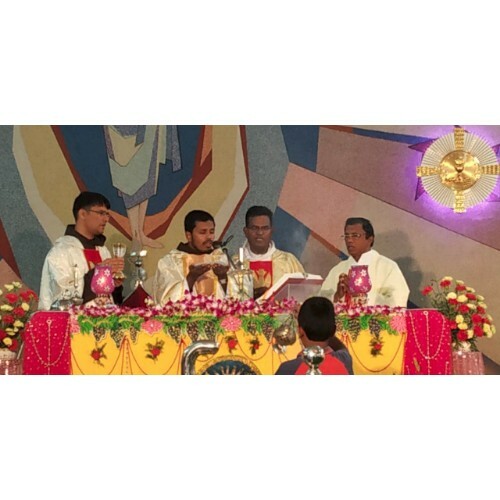 Rajasekhar, Brother Sleeva, the Vocation facilitator of Rajasekhar, thanked God and the family for the gift of Rajasekhar. Then, the God-mother presented Rajasekhar to the Minister Provincial saying, “Hence forth this son of ours belongs to you.” This was a touching and inspiring moment for all who were present at the house. 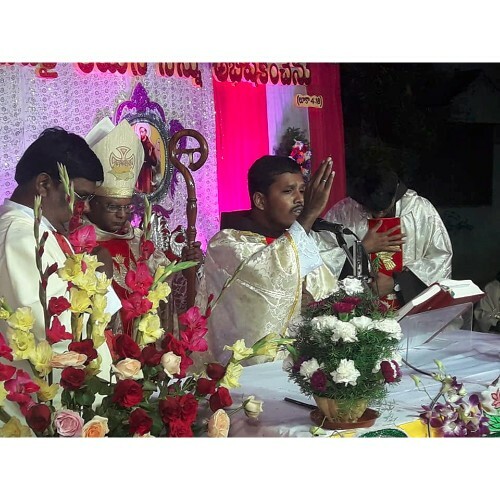 Then, Brother Rajasekhar was escorted to the Parish Church and there he presided over the Eucharistic Celebration of Praise and Thanksgiving. Brother Sleeva Reddy preached an interesting and inspiring homily. Personally, I enjoyed my stay and the Hospitality of the people as well as of the family members of Brother Rajasekhar. Praised be You, my Lord, for our Brother Rajasekhar who has gifted his whole self for the growth of Your Kingdom in our world! May God bless you, dear Br. Rajasekhar, and may you have a meaningful and spiritual ministry in the vineyard of the Lord!